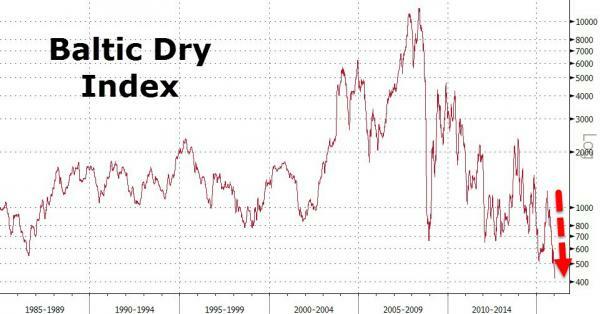 Another day, another plunge in The Baltic Dry Index, which just dropped a further 3.1% to 402 today - a new record low. While the index is driving headlines, under the surface, reality in the shipping (and shipbuilding) industry is a disaster. Total orders at Chinese shipyards tumbled 59% in the first 11 months of 2015, and as Bloomberg reports, with bulk ships accounting for 41.6% of Chinese shipyards’ $26.6 billion orderbook as of December, there is notably more pain to come, as one analyst warns "Chinese shipbuilders won’t be able to revive even if you try breathing some life into them." About 140 yards in the world’s second-biggest shipbuilding nation have gone out of business since 2010, and more are expected to close in the next two years after only 69 won orders for vessels last year, JPMorgan Chase & Co. analysts Sokje Lee and Minsung Lee wrote in a Jan. 6 report. That compares with 126 shipyards that fielded orders in 2014 and 147 in 2013. As Bloomberg reports, the weakening yuan and China’s waning appetite for raw materials have come around to bite the country’s shipbuilders, raising the odds that more shipyards will soon be shuttered. “The chance of orders being canceled at Chinese yards is becoming greater and greater,” said Park Moo Hyun, an analyst at Hana Daetoo Securities Co. in Seoul. Bulk ships accounted for 41.6 percent of Chinese shipyards’ $26.6 billion orderbook as of Dec. 1, according to Clarkson Plc, the world’s largest shipbroker. That compares with a 3.5 percent share at South Korean shipyards, which have more exposure to the tankers and gas carriers that are among the few bright spots in a beleaguered shipping industry. Builders have sought government support as excess vessel capacity drives down shipping rates and prompts customers to cancel contracts. Zhoushan Wuzhou Ship Repairing & Building Co. last month became the first state-owned shipbuilder to go bankrupt in a decade.